The giant Tian Tian Buddha of Lantau Island in Hong Kong. Lantau Island is one of the component parts of the territory of Hong Kong. The Po Lin Monastery houses a giant Buddha called Tian Tian Bouddha. 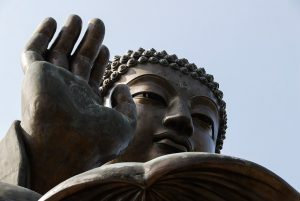 Made of bronze and measuring not less than 34 meters high, overlooking the scene, it is sitting at the top of the Ngong Ping hill. L’île de Lantau fait partie des quartiers composant le territoire de Hong Kong. Le monastère de Po Lin abrite un Bouddha géant appelé Bouddha de Tian Tian. Confectionné en bronze et mesurant pas moins de 34 mètres de haut, il surplombe les lieux en haut de la colline de Ngong Ping.